Let’s indulge in a bit of parallel modern history. What if the Cold War had continued on into the present day, stuck in the rut of its 1950s origins? Based around the opposing ideologies and world doctrines of the time, NATO and the Warsaw Pact were the literal manifestation of the polarized split of world politics in the aftermath of the Second World War. The North Atlantic Treaty Organisation was assembled in 1949 as a trans-atlantic alliance against the rising tide of Communist agitation in the East of Europe and Asia. 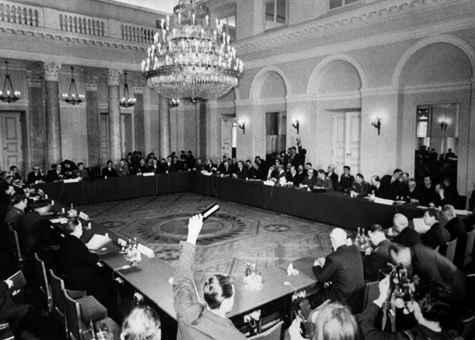 The Warsaw Pact was, likewise, a mutual defense treaty but agreed between the eight Communist states of Eastern Europe and signed as a reaction to the integration of West Germany into NATO in 1955. In this alternative reality fantasy, NATO and the Warsaw Pact’s founding member states have lowered their nuclear deterrents for the sake of humanity, preferring to shift their opposing political struggle to the less deadly but no less serious theatre of Cold War conflict: the football pitch. The battleground has been drawn in Berlin, and so the game itself will be hosted at the Olympiastadion, despite late attempts from the United Nations, Qatar Investment Authority and the Nationalised Soviet Gazprom Commune to relocate the match for sponsorship and TV purposes. Bruce Arena, democratically elected above Sir Alex Ferguson, Jose Mourinho and Guus Hiddink by his all-American power base, has been charged with constructing a transatlantic compendium of NATO stars, featuring at least one player per founding nation. Following on from the Conferences of Yalta and Potsdam (the ideal opportunities for match preparation and squad building), Arena has picked a side fit to carry the hopes and dreams of the West, collecting their names within his star spangled almanac. Restricted in his selection criteria by a NATO edict for equal and fair representation across the member states, the American coach must overcome European sneering and his own whispered distaste for inefficient, democratic bureaucracy to win the day for capitalism, consumerism and freedom. In response to the West’s Imperialist pitch-side sabre rattling, Soviet sport scientists have gathered in Warsaw to pool their resources into a centralised and collectivised footballing congress. Soon, the Duma announce that Oleg Blokhin will become the Supreme Team Commander of the Warsaw Pact squad, a hero to the football playing proletariat. After a referendum was put to the people of the West, the populous favoured a vogue 4-3-3 formation for Arena to work his ‘One Nation, One Player’ quota around. Arena, all too aware of France’s deep-seated tendency to rock the political boat at the earliest sign of turbulence – either during a revolution or during a normal summer football tournament – resolved not to select an outfield Frenchman. Thus, Hugo Lloris, a generally recognised safe pair of hands, was a natural choice to act as the last line of defence of the free world. Arena is not just a canny tactician, but an educated man. Early on he recognised Luxembourg’s role in the creation of NATO and saw a problem – Luxembourg are not historically feared in the footballing fraternity. This is where Arena’s footballing nous took over, and he resolved that right back is, like long off in cricket, the best place to stick a less technically proficient player and forget about him. Arena took advantage of the freedom of the internet, a luxury granted by living in the West, and explored wikipedia where he found Eric Hoffmann, who, with 57 caps and 0 goals for Luxembourg, demanded selection. For a country so laden with attacking excesses, it seems perverse for Arena to choose a Belgian defender – but Vertonghen’s selection is in part (completely) dictated by the presence of Eric Hoffmann on the right hand side of defence. But Vertonghen is no short-term fix; a defensive powerhouse with an eye for goal, as highlighted by seven goals in his debut season in England. It may be poetic to some that Greece’s NATO representative is a centre-back, but young 21-year old Papadopoulos has been making significant strides in German football, catching the eye of the omniscient Bruce Arena in the process. 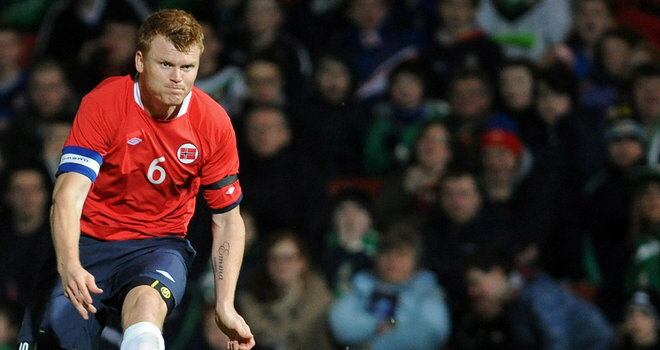 Riise may be some years past his best, approximately 10, but that did not stop Arena paying a personal visit to the only household Norwegian name in football. Famous for his marauding (brainless) runs from left-back and ferocious (wayward) strikes from distance, Riise will be a valuable (frustrating) tool in Arena’s armoury. The third of four Tottenham representatives in the NATO XI, Arena earmarked Sigurdsson at an early stage as ‘the Icelander to add steel to my stars and stripes’, before dismissing suggestions that he is not attuned to the domestic Icelandic game. The bastion of democracy must have a pin-up, and with David Beckham sidelined by commercial commitments to the Multinational XI, Arena moved swiftly to bring Italian adonis Andrea Pirlo to the side. During the press-conference to unveil Pirlo, Bruce gushed over his evergreen performances at Euro 2012 before dismissing suggestions that he had never heard of him before. Arena was embroiled in a damaging scandal that rocked the very foundations of democracy when reports emerged in America that he had taken a bribe from former US coach Bob Bradley to select his son Michael in the NATO XI. The Head Coach continues to reject the accusations, but critics point to the fact that everyone forgets Michael Bradley plays for Roma. The case rumbles on. Bruce Arena originally scoffed at those calling for Ronaldo’s inclusion, before being told by a senior aide that they were not talking about the Brazilian Ronaldo. Having familiarised himself with the Portuguese’s astonishing goalscoring record, the pair have since been spotted frequenting bars and restaurants together. Arena likes to keep on top of current affairs and is an avid follower of the British media, so despite having never seen the flying Welshman play football, he was sure to make him the focal point of his attack. The only German who wanted the gig. Arena was in protracted negotiations with a number of potential suitors, who later rejected the opportunity for fear of dividing the nation. Having been assured by his senior aides that UK representation included the individual principalities, Arena is reported to have let out a lengthy and despairing groan. His selection of Charlie Adam and Roy Carroll was allegedly made on the back of consumption of a bottle or two of fine Western Pinot Grigio. Due to the presence of a likely unfit half-amateur Luxembourger, Arena has been forced to draft in defensive cover, albeit English defensive cover. Arena remains a fervent believer in the old adage that goals win games – indeed he has a Thierry Henry quote framed on the wall of his office; “Sometimes in Football, you have to score goals.” By this logic Glen Johnson has been selected to provide the ammunition. Attack is the best form of defence in Arena’s eyes, and he regards non-ball playing defenders as enemies of the state. Junior Hoillett completes the transatlantic set, whilst Christian Eriksen and Arda Turan are there to make up the numbers and add some continental spice. With the encroachment of Communism a very real fear in Arena’s management, he believes that Dirk Kuyt is the ideal foot solider of freedom, who will shoulder the responsibilities of the free world and preserve the ideals of liberty. Arena’s strategy will reflect a direct attacking style that will seek to dominate. Though the Head Coach has come under fire for choosing a high number of individualistic freestylers who won’t pass to each other or track back, Arena insists that his love of freewill and democracy, coupled with a profound fear of subversion, will never see him betray his roots. Having manoeuvred his way into the role of Supreme Team Commander following the vacuum left by the death of Valeriy Lobanovskyi, Oleg Blokhin has stamped his authority on the Warsaw Pact XI. The desires of the proletariat and demands of his ideological superiors do not bother him, for Blokhin has gone rogue, ignoring the rigid dogma of the state’s sporting directives to create a team in his own, interpreted image of Soviet football. Declaring his belief in the universality and heroic work ethic of the footballers of the Warsaw Pact, the Ukrainian places his faith in a tactical glasnost. His team will play collectively and work hard for each other, but with allowances for individual skill and creativity when appropriate. Of course, Blokhin has been accused of harbouring ideas and concepts opposing the revolution, with his radical shift to a 4-2-3-1 formation from the traditional 11 formation. Believing it to be sufficiently neo-traditional – entitling it perestroika – he argues that the formation will allow socialist theorists to modernize their footballing principles. Detractors have labelled it utopian, with Georghe Hagi leading a school of thought accusing Blokhin of deliberately betraying the ideals of ball retention. Supreme Commander Blokhin’s first selection is a no-brainer. Czech goalkeeper Cech’s first job, however, will be to swap his Adidas sponsored scrum cap for one produced in the fires of the industrialised Urals. Blokhin is a ruthless disciplinarian, and though he favours allowing his charges a certain freedom of thought on the football pitch, he is all too aware of the dangers inherent in giving them too much, too soon. At 30 years old, Soviet Union international Aleksandr Anyukov is a player that Blokhin knows will not rock the boat. No one screams man of the proletariat quite like Martin Skrtel. Win the ball and offload it at the earliest opportunity, the Slovak is an expert in the rudimentary side of the game. Having been trained and nurtured in the old Soviet citadel of Petrograd, Blokhin identified Skrtel as an automatic choice early on. Blokhin admires experience and loyalty to the state – 32-year old Chivu fits the bill. No longer a swashbuckling, idealistic young revolutionary, Chivu’s beliefs have mellowed with age. Like Cech, will be making a trip to the Urals to produce his own state scrum cap. Polish international Piszczek is not a left-back, but Blokhin is a principled champion of universality, and yearns to cultivate a ‘positionless society'; there are no positions on a football pitch, only positions on the field where the ball is likely to figure. Blokhin believes Piszczek’s aptitude on the right-hand side will naturally transfer itself to the left. Albanian captain Lorik Cana’s place in the team has caused quite a stir in Warsaw Pact circles, given his Yugoslav roots. Many have labelled him a social alien, but Cana is believed to be fully committed to self-transformation. Kroos was initially reluctant to assimilate into the Warsaw Pact, but having heard of his ideological enemy Marco Reus’ selection for NATO, the Greifswald-born midfielder was only too keen to take the call. Blokhin is concerned by Hamsik’s individuality, revolutionary fervour and natural attacking instincts, but is beginning to come round to the idea that, despite a philosophy that yearns to share the burden of possession, it is goals that win football matches. He is convinced that Hamsik’s precocity can be nurtured into a valuable tool for the benefit of the state, though his selection is on condition of a haircut. Mkhitaryan is viewed as less of an upstart as Hamsik. His ability to play across the attacking midfield trio has seen him gain the untold respect of Blokhin, who has resolved to centre the team around the talents of a man who epitmoizes his revolutionary approach to Socialist football tactics. Completing the young trio of attack minded midfielders is young Soviet icon Alan Dzagoev. The Beslan born attacking midfielder has been the subject of unprecedented levels of hype and publicity due to his stunning good looks. Blokhin has denied rumours that his young star has engaged in counter-revolutionary underground militant movements, and believes a battle against the West will prove his loyalty to the state. Even with his other concessions to universality Blokhin has shocked and appalled many of the adherents of Lobanovskyist policy by naming an out-and-out striker in his lineup. The coach believes that Lewandowski’s ability to join in buildup play will vindicate his perceived betrayal of the revolution, whilst his reputation as the forefront ‘number 9′ in world football further breaks from the tradition of a numberless and positionless football society. The selection of known dissident Dimitar Berbatov has caused outrage amongst the upper echelons of the Warsaw Pact, but Supreme Commander Blokhin admires his individuality. His place among the substitutes appears to be a political compromise. Wojciech Szczęsny, another who has not taken the goals of the regime to heart, has made the cut, whilst experienced elder statesman Miroslav Klose adds some real firepower. In Blaszczykowski, Tymoshchuk, Rat and Gera, Blokhin has capable and willing yes-men, who will adhere to the collectivisation of possession. 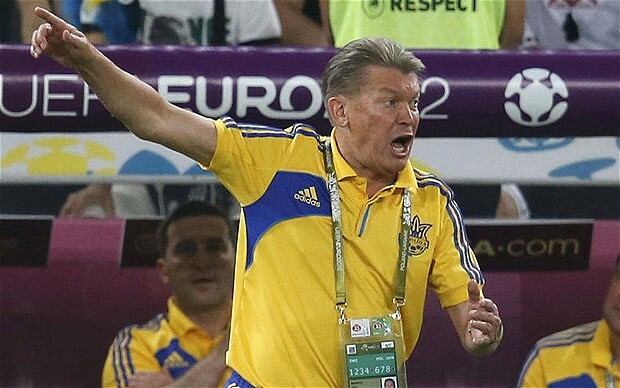 Possession, Blokhin insists, is almost as important as victory. If the Warsaw Pact is to catch up with its Western superpower, then it will be through ball retention, not individual quality or the trivial, man-made distraction of goals. The battle lines have been drawn. Who will come out on top to carve a new world order? This entry was posted in Hypothetical XIs and tagged bruce arena, cold war, football, nato, oleg blokhin, warsaw pact by James Dutton. Bookmark the permalink.